Going into Friday's open, the short term trend had come back into line with the long term bullish trend. Overnight value had built overlapping higher to the prior day. 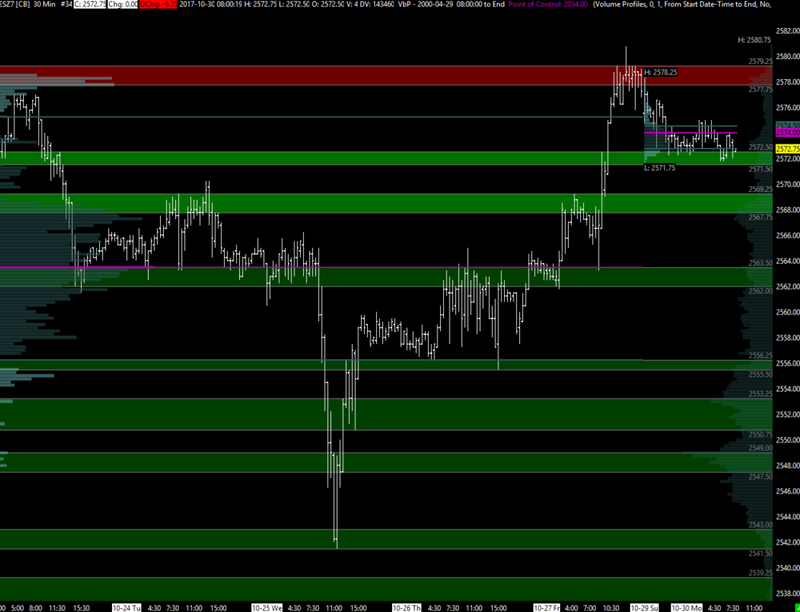 Opening at 2566.50, there were a couple of tests of the initial support zone. Once the market broke higher, through the overnight high at 69.25, there was a reaction at the 71.75-72.50 resistance zone which gave a pullback into the overnight high once more (see above circled). Forcing action through the initial balance high left single prints until a new all time high was made (2580.75) and the market balanced at higher prices for several hours into the close. There's a small selling tail left on Friday's profile showing some sign of excess. Overnight has balanced in the area that didn't trade much on Friday, ranging so far between 2571.75-78.25 versus settlement at 78.50.